The opening scene of Werckmeister Harmonies must be one of the most engaging and wonderful ever made. This apparent setting of the tone and the way subsequent events unfold make us very grateful we knew nothing about this film before we sat down to watch it. The experience was… incredible. How wonderful to be surprised and enthralled by a brilliantly-made film! Werckmeister Harmonies is set in a freezing provincial town somewhere on the Great Hungarian Plain. It is director Béla Tarr’s rendition of László Krasznahorkai’s 1989 novel, “The Melancholy of Resistance”. Tarr’s life-partner, Ágnes Hranitzky, co-directs and edits. Peppered throughout the film are profoundly moving, indelible vignettes. Some of these mark subtle yet critical points in the story which signal major developments. The stillness which accompanies such moments is palpable; the pacing and acting perfect. Filmed in high-contrast black and white, and clocking in at 2 hrs 25 min, this art house drama comprises just 39 unhurried long takes. This approach allows Tarr the opportunity to capture the mood of each scene perfectly. And each scene has its own mood; the long takes are not a reflection that the storyline is creeping along – big changes are afoot. All of these long unbroken takes are superb, yet some are outstanding. Such as when the protagonist weaves his way through a crowd, the camera following him for some time, then cutting its own path, then effortlessly finding the actor again. The breathing space given by such an unhurried cinematic technique allows viewers the time to immerse themselves in the thoughts of the characters as they ponder their predicaments. It allows the drama to build up effectively because we also have the opportunity to study the possible ramifications of the latest events. 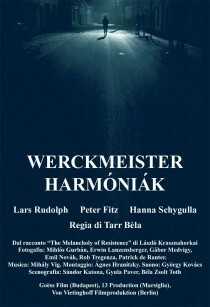 It is a shame that a slow-paced and long film such as Werckmeister Harmonies has such limited appeal to worldwide audiences. But so it is. Thank goodness some of us have the patience to savour such delicacies as this one. Thank goodness films like these have been and are still being made. You can find more information on this Hungarian movie on Wikipedia and IMDb. I think its a common “sickness” today of fast moving and fast changing action scenes. Its often action instead of content. I reality the action is there to hide the fact that there is not content. You are, in the best cases, entertained for a short while but leave with no new insights. The opening scene is perhaps the most beautiful of any film I’ve ever seen. Makes my insides smile, every single time. A perfect review – I like your words. From the very first sentence I read on your review in this post, I already like it. Kudos! Hi, Old Man. It is very motivating to hear that we have influenced someone to watch a great film and thank you so much for providing feedback. We have gotten hold of a copy of Jim Jarmusch’s Down by Law, so we’ll be watching it sometime soon – thanks again for the tip via our feedback form. Greetings to you in Mongolia. We’ve just tweeted your address to our 263 followers on Twitter. Probably the most astounding movie I have seen in the last twenty years. Oh my what a film. Was so happy to happen upon this unusual and entrancing film. And the soundtrack of course. Well done on the site. Would also recommend “Satantango” by Tarr which is 7 hrs long but a great film as well. Also suggest reading both Krasznahorkai’s novels on which “Satantango” and “Werckmeister” are based: They are challenging but are a terrific complement to the films. A good starting place for Tarr’s films is “Damnation”. All the best.